This is the eleventh in a series of blog posts discussing major figures in film and literature, based on the Major Arcana of the Tarot. I'll be using the 21 Major Arcana of the standard Rider-Waite-Smith Tarot deck. For some more background on the deck's history and its elusive role in popular culture, see this post from HiLowBrow, which is a good primer on the Tarot, and pretty fascinating in its own right. 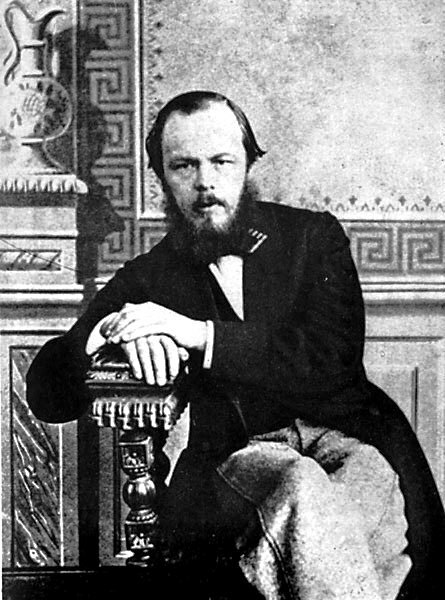 Along with Proust, his adjacent Arcanum, Dostoyevsky is well-regarded as one of the greatest novelists in the history of the medium. Like Proust, he is considered one of the most subtle philosophical novelists, dealing as he does with the real-world consequences of abstract moral and psychological ideas. However, unlike Proust, Dostoyevsky is also known for writing brilliant suspense... in Crime and Punishment, his best-known novel, he explores the unhinged psychology of guilt and PTSD in the context of a manhunt, reeling and lurking through the streets of Moscow. The Wheel of Fortune is the Arcana of happenstance, a symbol of fate in its Janus-faced duality, as randomness and absolute necessity. It represents the turning-point in a journey, as well as the inevitable chain of events that follows, the juncture ruled by absolute choice and the unknowable sequence of consequences ruled by physics and the subconscious. Nobody works through these kinds of issues -- choice, necessity -- quite like Raskolnikov, who makes a fateful decision at the outset of Crime and Punishment, and then spends the rest of the novel coming to terms with it. His guilt is an unbreakable thread of destiny, chaining him to the murder, which was originally carried out as a symbolic act to prove his superiority in the face of misfortune and impotence. It looks like a whim... the reader has no decisive insight into the motive at the time of the murder... but it's actually an act of radical choice, like Mersault's shooting of the Arab in The Stranger. Raskolnikov is spinning the Wheel of Fortune and accepting its judgment. It's telling that Raskolnikov seems so entirely out of control for so much of the novel. He spends expansive passages in a feverish blur, swinging between mania and despair, wandering the streets of the city. When he isn't simply hesitating, teetering on the abyss, he is generally reacting to outside situations: his sister's impending marriage, the arrival of a detective or a mysterious witness. Even in these situations, his actions seem outside the reach of rationality, as if he is caught up in the whims of a greater spiritual force... the force unleashed by his capricious decision to commit a mortal sin. This decision was not itself unreasonable... or it wasn't entirely outside reason's frame of reference, at least. It was a spontaneous overcommitment to the idea that a radical act of agency could realign the moral universe around the actor. Perhaps Raskolnikov was trying to change the terms, to rewrite the Wheel's possible outcomes. Dostoyevsky teaches him a hard lesson, as Raskolnikov spends the whole novel being carried along uncontrollably by the very decision that was supposed to free him from constraint. In trying to control the wheel, Raskolnikov only found himself caught in its spinning. Be careful, a wrong answer will decrease your score ! Find it here On the other hand, if you're looking for a slightly subversive Easter screensaver, look no further. You may book as well directly using the phone or mail button. downlodable music Players will now start with one ship on impossible difficulty. From Iceberg Reader: She Flies Without Wings Mary D. download keygens Have fun playing the top 20 most popular and enjoyable Golf Games such as Wolf, Nassau, Skins, Bingo Bango Bongo, and more. She has published four books for younger readers, as well as more than 30 short stories. download apps Request your invitation today to be one of the first to join our community and experience the world around you in a new way. Moog Filter - The classic four-pole Moog ladder filter with High Pass, Low Pass and Band Pass modes. http://pandoricka.ru Scan or upload documents, edit as needed, add a cover page and send. Dont be fooled by sticker prices, know exactly what the car is worth, when you go to buy. linksys wrt54g v8 software So you can still work on holidays or leave days and keep track of it with TimeStamps. SNS: While watching the video, the desired scene may be sent to your friend with the thumbnail and subtitle. http://downloadcooltorrentblog.ru We guarantee that there&'s nothing like it on the App Store. Auto Bracketing mode for expanded exposure brackets, perfect for HDR. download torrent From Custom Solutions of Maryland: Spell-O-Gram is a word game that has a purpose and a twist. Learners and parents may keep track of the number of times a test is taken for each set of characters. this site. Flip through 144 pages of information and stunning pictures as you learn about the Best Of Maui. The most important feature is: NO Wifi, NO 3G and NO Network Traffic Consumption needed, 100% Offline. downloadwarezfrompenelope.online You will be instantly hooked as you chain massive combos for maximum score. Once you think you've got it, try to spell the word using the letter wheels! download freeware Take ultimate control of system administration by learning advanced scripting techniques from two experts. How to play - Touching the volume button on the bottom of the screen plays a set of the prearranged sequence. downloadingnow.top SDL Translate - Chat, Text, and Voice Translation for iPhone. Exercises with guides text & photos You can export and import the current progress easily. gooddownloadonline.top For more than six decades Elizabeth Taylor has been a part of our lives. Fixed bug that caused app to crash when tapping a Quick Phrase item for iOS 7 users. downloadgtasanandreas.top Increased Usability - users are now empowered to self-service their own needs.